Our last FREE FAIR TRADE FRIDAY Giveaway: Win 2 fantastic prizes! This is the fourth and FINAL installment in our giveaway series celebrating Fair Trade Month. Make sure to enter for your chance to win! One lucky winner will receive not one, but TWO FREE gifts. First, you will get an apron made of hand block printed fabric, with two pockets, that is completely adjustable and sized generously (available in red, turquoise, endive, cumin floral or orange lotus). 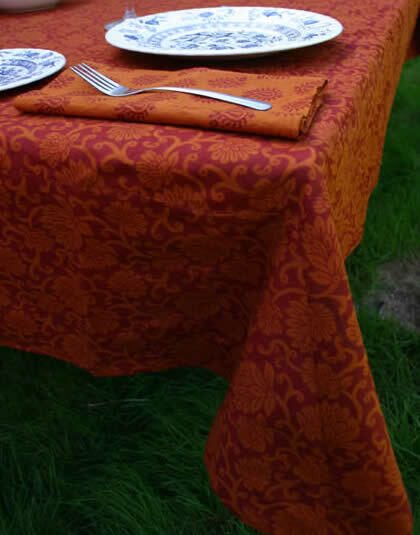 Secondly, you will receive a tablecloth, either 60×90 or 60×120, that is available in orange lotus, plum floral, spruce, rose, cumin floral and endive floral. You and your table are sure to be a hit at your next dinner party! Entry filed under: Contests, Fair Trade, Giveaway. Tags: contest, fair trade, giveaway, Marigold, organic. As a mom, I’ve got to say I’d LOVE to see a fair trade market emerge for kid’s clothing! I have found plenty of fair trade baby apparel, and plenty of adult clothing, but next to nothing for kids once they’re past the toddler stage. Fair trade is really important to our family, so we are often frustrated when it comes to purchasing for our elementary school aged children! Alcohol – Countries like Mexico and the Caribbean Islands produce HUGE numbers of Tequila, Rum…etc. I would love to know that the people that work so hard for those factories get treated fairly. I did see how hard and for little money these woman and men work to produce the liquor we all purchases when we take a trip to these countries and Islands. We would love, love, love to find a great fitting pair of fair trade jeans. That and fabulous fair trade tall, vegan leather boots. We literally dream of these products. I would love to see rice and grains become Fair Trade (if that’s possible and not already happening). It’s such a large crop yield, that it would affect many many people around the world. I am also a twitter (@LookLuke) and Facebook follower!